The past months have been stressful. While I never have trouble falling asleep, I often wake early in the morning (anytime between 2 - 4 am) and find my mind is in turmoil worrying about my mother (regular readers will know that she has been living with dementia and that I've struggled to find the best way forward to give her the support she needs). Recently I've been trying a few sleep apps and thought I'd share my experiences here in case other people are considering trying these as well. 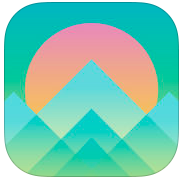 The app is free and 10 of the meditations that focus on relaxation are also free. There are over 3 and a half hours of sleep meditations ranging from around 6 minutes to just over 20 minutes, and 4 other packs that can be purchased that deal with things like stress, anxiety and pain. You can also buy an "Everything Forever" pack which gives you access to all the meditations and all the new ones that will be released in future. I like this idea much better than apps such as Headspace where you have to pay a monthly subscription. The Everything Forever pack is roughly the same price as a single month's subscription to apps such as Headspace. 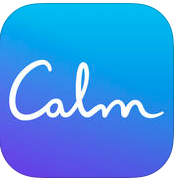 Another app I've downloaded recently is called Calm which has various meditations for breathing, sleeping and relaxing. This is also a free app that allows you to make in-app purchases for monthly or yearly subscriptions. There are also several free guided meditations. This app is different in many ways from Sleepfulness. For example there are beautiful natural scenes that you can look at along with ambient sounds such as rain. There's music to help you relax as well, and stories to help you get to sleep. There's also the Daily Calm which is a daily 10 minute mix of meditation and inspiration. With this app you start with 7 Days of Calm. Each day there is a different focus. You will go through guided breathing, paying attention and a body scan, followed by a session on training your mind, living in the here and now, patience and awareness. After that you can go into other free areas such as Loving Kindness. There is also 7 Days of Sleep which you listen to in the evening to prepare your mind and body for sleep - the meditation voice is over the top of the ambient nature sounds. At the end is the suggestion to do a body scan later in bed - you can choose the time for this from 3 minutes to 15 minutes. Calm also contains timed unguided meditations where you can choose an end bell or to have a bell playing at regular intervals to bring your mind back to meditating. I have used the Calm scenes several times recently to help me fall asleep. I assumed (wrongly) that after a certain time the ambient sounds would stop, however when I woke up in the morning they were still playing - possibly this helped me to get a deeper sleep, though I'm not sure. What apps have you used to help you get a deep and relaxing sleep?